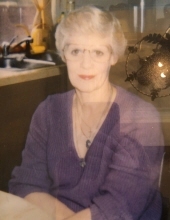 Betty Ann Moats, age 82, of Mt. Dora, FL, peacefully passed away on Friday, March 22, 2019. She was born February 1, 1937, in Chicago, IL, the daughter of the late Marshall and Jane Marie “Dora” (nee LaVallie) Waldren. In her spare time, Betty enjoyed fishing and crossword puzzles. She was a very independent woman who loved her family deeply. She is survived by her children, Michael (Arlene) Stair of TX; John (Karen) Stair of Lockport, IL; Donna Seelhoff of CO; Laura (Art) Mensik of New Lenox, IL; Deanna (Greg) Wilson of Lisle, IL; Debbie (Michael) Cardamone of Oswego, IL; partner Donald Moats of Mt. Dora, FL; sister Midge (Don) Seeman of AZ; brother Art Waldren of IL; 12 grandchildren and several great-grandchildren. She was preceded in death by her sisters Dori Coluzzi and Louise Kryza, and her brother, Robert Waldren. A visitation will take place on Saturday, March 30, 2019, from 2:30 PM until a funeral service at 5:00PM at DUNN FAMILY FUNERAL HOME with Crematory, 1801 S. Douglas Road, Oswego, IL 60543. To send flowers or a remembrance gift to the family of Betty Ann Moats, please visit our Tribute Store. "Email Address" would like to share the life celebration of Betty Ann Moats. Click on the "link" to go to share a favorite memory or leave a condolence message for the family.